Johannesburg – Turn it off and get used to it. Yesterday, Eskom chief executive Tshediso Matona apologised profusely for load shedding and unveiled a grim calendar of 36 likely load-shedding days until the end of March. “It really pains us to have to load-shed. We know the public does not take kindly to it,” he said. But it’s going to continue, and Matona and his executives urged the public to learn how to read load-shedding schedules, to keep them handy and plan ahead. Eskom’s system outlook calendar logs three days of probable load shedding this month: Monday, (which took place), Thursday and Friday. “The week ahead will be very tight, with a medium risk of load shedding, and a high risk on Thursday and Friday,” Matona said. Eskom expects a breathing space until February, when almost every working day is marked in the red of probable load shedding, and March, which isn’t much better. “It’s a total of 36 days of probable load shedding, along with another 59 marked in yellow as medium risk of load shedding and just 18 in the low-risk green,” Matona said. 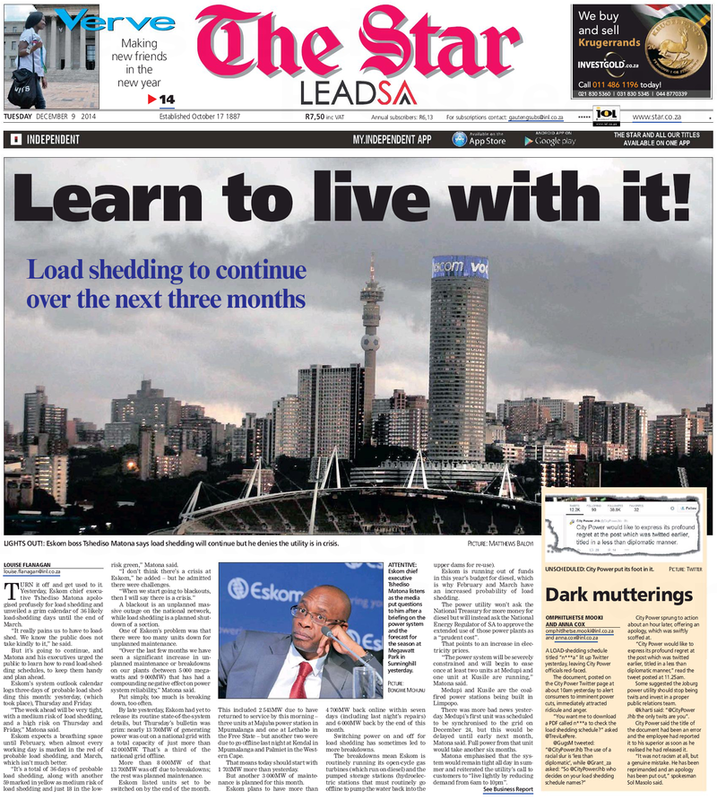 “I don’t think there’s a crisis at Eskom,” he added – but he admitted there were challenges. A blackout is an unplanned massive outage on the national network, while load shedding is a planned shutdown of a section. One of Eskom’s problem was that there were too many units down for unplanned maintenance.